Ever since RankBrain first launched, there has been a lot of confusion over how exactly it impacts SEOs and site owners. 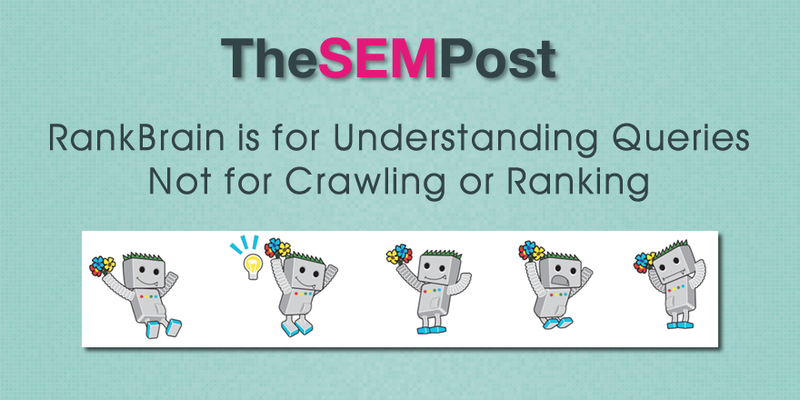 While we know it has a greater impact on search queries that Google has never seen before, Gary Illyes from Google has cleared up some of the more popular misconceptions about RankBrain and how it affects some areas popularly connected to RankBrain such as crawling and ranking. The understanding queries part is well known right from the initial RankBrain launch. John Mueller was asked just this week about RankBrain and its relation to crawl budget, and he also confirmed RankBrain does not impact crawl budget either. RainBrain is also particularly good at dealing with the 15% of search queries Google hasn’t seen before. He also clarifies that this means RankBrain helps on the types of negative queries that Google doesn’t often see. This is pretty important, and many seem to be missing it. Illyes is saying that RankBrain isn’t making up any of its own algo signals – something many are wrongly assuming RankBrain does – when it is handling these types of queries, but it can weight existing signals to understand and answer queries better. Illyes also said something similar to this once RankBrain became known, that RankRrain is not continually learning. And machine learning expert Jack Clark also said RankBrain is periodically re-trained, but it’s not learning on-the-fly. So it seems much less a factor in creating ranking signals, something many SEOs have been speculating recently. That has clarified the confusion and made understanding batter – RB is not something new factor, it’s an addition to existing ranking signasl. Let me know if it;s not the case. A Fascinating topic Jennifer and an equally enjoyable read. Thanks. I’m not sure about what Illyes said about the fact that RankBrain doesn’t use any new factor. If the algorithm produces a new mathematical representation of the query, in order to compare the query with the resources, it would be necessary to calculate a representation of each resource using the same methodology used to analyze the query. This new representation of each resource would count as a new resource signal. Does anyone know the stat on percentage of daily queries google gets that they have never seen before? I.e “negative queries” or “the long tail”. When they announced RankBrain, it was 15% that were never before seen queries. Don’t think rankbrain is all that to be honest. Understanding queries sure and the context behind those queries is pretty important obviously. But from a purely commercial point of view don’t think it matters. For example “Lawyers in New York” and “Are there any Lawyers in New York”. Are both still just gonna show the lawyers. Same for any product and any services too. Think the only thing that changes is informational and non-commercial SEO….. Just my thoughts. I’ve found that by understanding it’s purpose having recognised it’s existence has already proven crucial in diagnosing a recent client issue. It involved a high value, query for a gambling site, once which the client’s site had become (due to language vectorisation) no longer a match for the query. It had previously monetised that phrase by Google’s former failing to distinguish sufficient context.